One of my favorite things to do on Sundays is to spend time with my family in the kitchen. And luckily, one of the things we love most about our house is how open the kitchen is to the whole house. We can be in the kitchen and still feel part of everything that is going on. 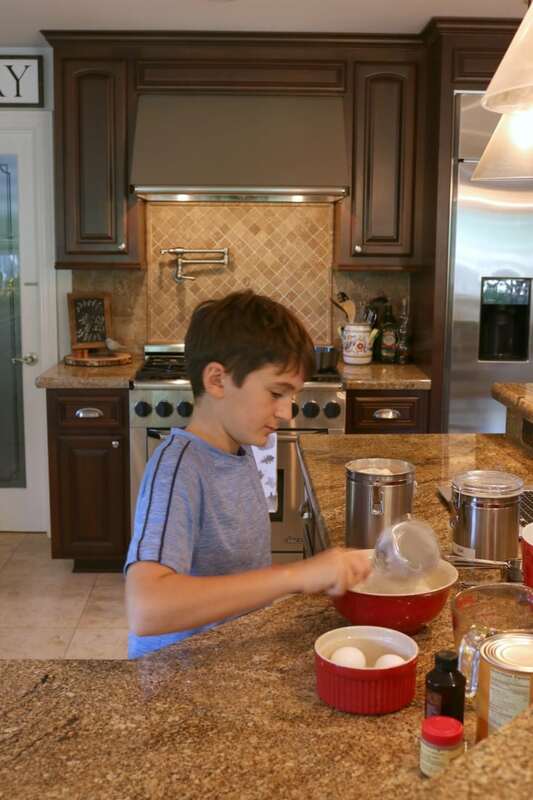 But what makes cooking so much fun lately is that my oldest son Roan loves to cook! This is a blessing during the week when I just don’t have the energy. He’ll cook up his favorite dishes. Steaks with Roan’s “special sauce” and Caesar salad with homemade dressing and croutons! Ohhh! This is so good! 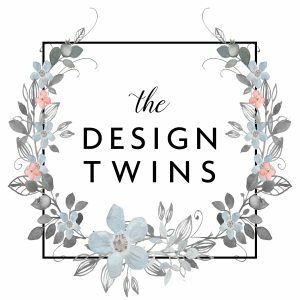 As part of the Better Homes & Gardens at Walmart Influencer Network every month we are given a design theme or challenge. 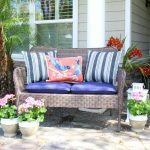 This month we were asked to share how Better Homes & Gardens products from Walmart help us enjoy relaxation or family fun activities at home. This is a sponsored post, but all the opinions are our own. We have included convenient affiliate shopping links. Shopping with us helps support our blog and comes at no additional to you. We hope you enjoy. 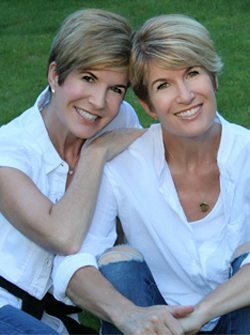 To find more inspiration from the BHG Live Better Influencer Network this month click HERE. As my boys get older and are now in their pre-teen and teenage years (Roan is 13 and Reese is 11), it definitely has become harder and harder to get them to “hang out” with mom. Roan and Reese like sports, not shopping. They like video games, not fashion. They like watching YouTube videos, not watching romantic comedies. Go figure!! Most of you already know that I am not a huge fan of cooking, but did you know I have always LOVED to bake? Yes, it’s true. Chalk it up to a sugar obsession that has been around since my childhood. I actually still love to bake. I try not to give in to this passion of mine too often because it’s pure sabotage to my diet, but when I can combine time spent with my son, I’m all in! Pumpkin Spice Season is HERE!! 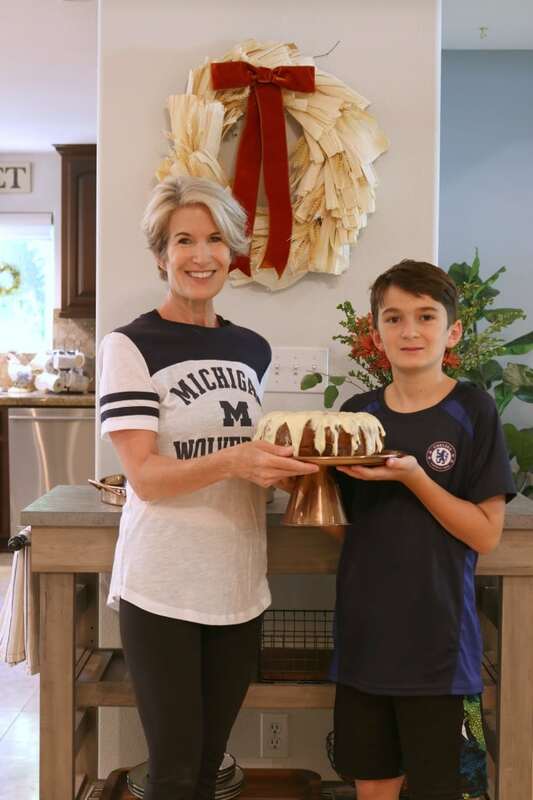 This past Sunday Roan and I decided to combine one of his favorites, pumpkin bread, with one of my favorites, CAKE, and try out a new recipe. We actually combined two recipes. The first was from Martha Stewart. 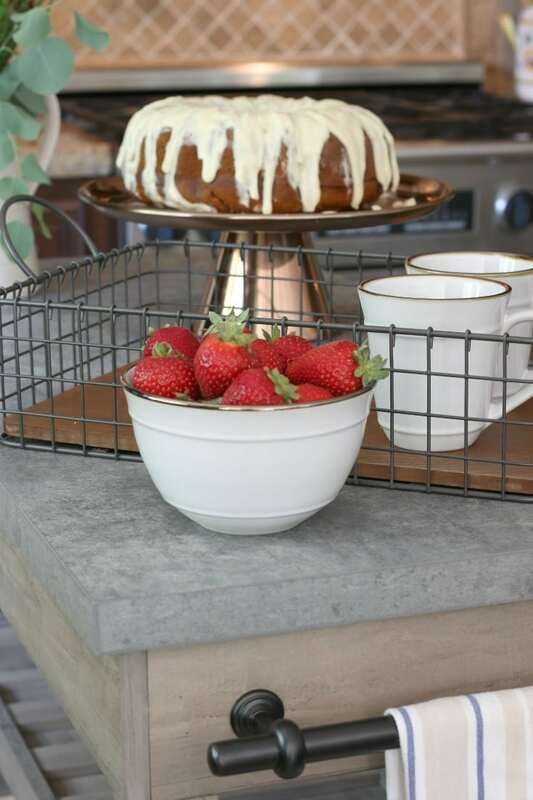 I loved the sound of their Pumpkin Spice Cake & Honey Frosting …but the cake was for a 9″ x 9″ pan and I had my heart set on making a Bundt cake. Then I found the recipe from the blog, Two Peas and Their Pod, Pumpkin Bundt Cake with Cream Cheese Frosting which looked perfect. Since I didn’t have any confectioners sugar on hand I decided to mix the recipes, combining the Bundt cake recipe from Two Peas and Their Pod with the Honey Frosting from Martha Stewart. Yeah! One less trip to the store is enough to make this mama happy! The recipe was simple to make! No special equipment or techniques needed. I would call it a fool-proof recipe! Fool proof unless you count the mishap which occurred when I was icing the cake. Suddenly the entire thing slipped off the counter and fell upside down on the kitchen floor!!! I thought all was lost and paused for a moment with my head in my hands….then calmly decided to see what could be salvaged. I picked up the cake (which was incredibly still in one piece) and put it back on the stand. The perfectly drizzled icing was now a bit of a mess, but Roan and I managed to use the last of the frosting to cover it up. In the end it wasn’t perfect, but we were happy with the way it came out. The floor was covered in honey, butter and cream cheese but what would a good cooking adventure be without a bit of a mess? First of all, who couldn’t use more counter space? Am I right? 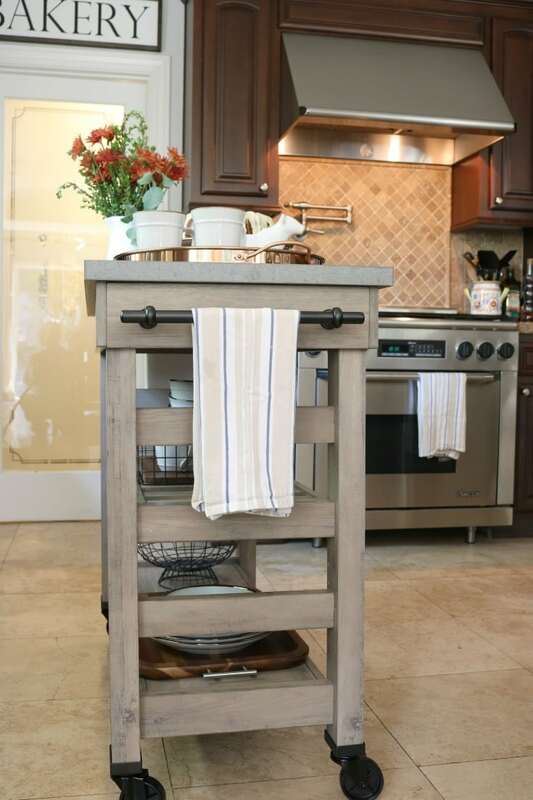 I am absolutely in love with my new kitchen island from Better Homes & Gardens collection available from Walmart stores and Walmart.com. Quite honestly, I never would have anticipated just how useful this island would be. I thought I had enough counter space, but I was wrong. 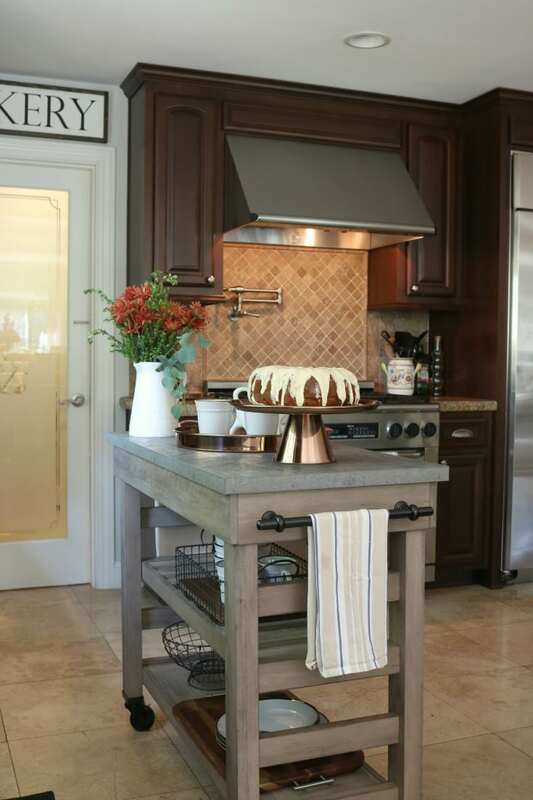 This island bridges the gap between my counters and is amazingly helpful. Next, let’s talk about the quality of this piece. It is extremely sturdy and made well. 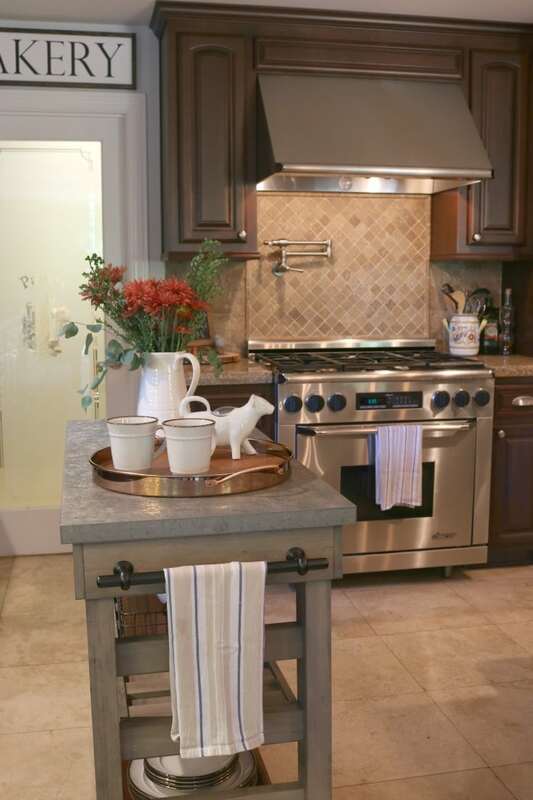 The counter top is faux cement and is as beautiful as it is durable. Everything about my new island is functional as well as stylish. 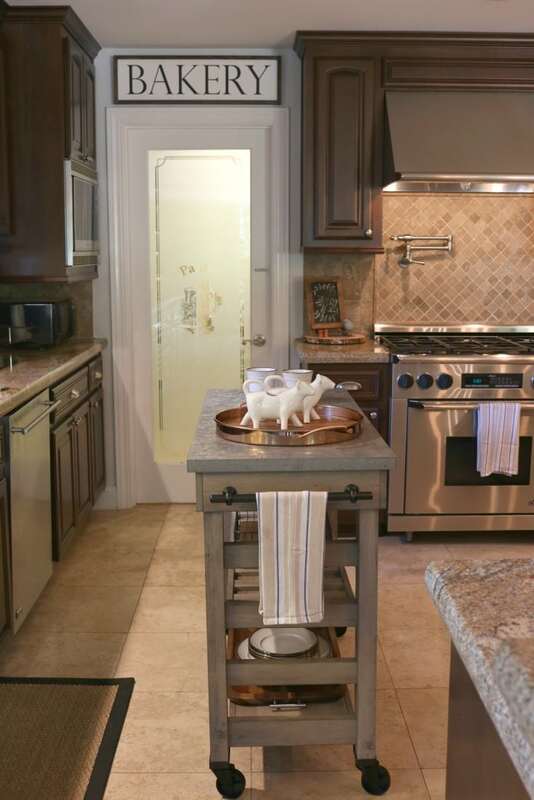 I love the charming farmhouse details, including the rustic finish and hardware. Having an extra hand towel nearby is also super handy!! 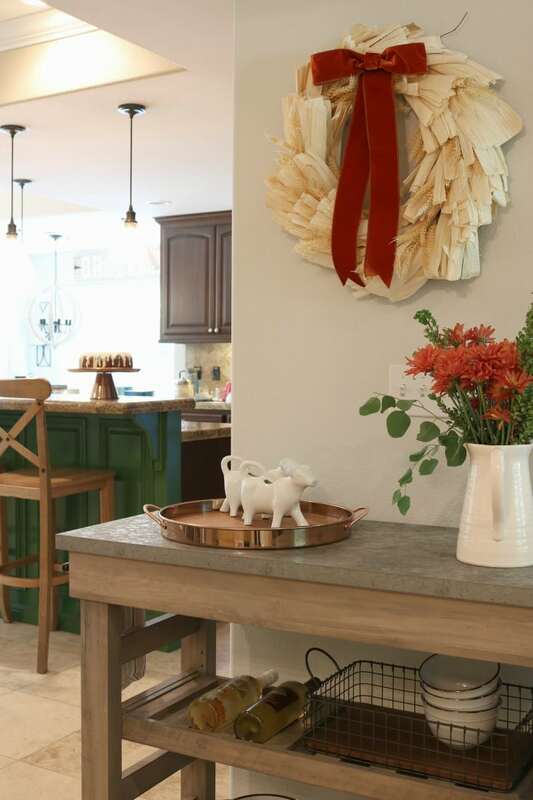 The modern farmhouse style adds charm to any space. 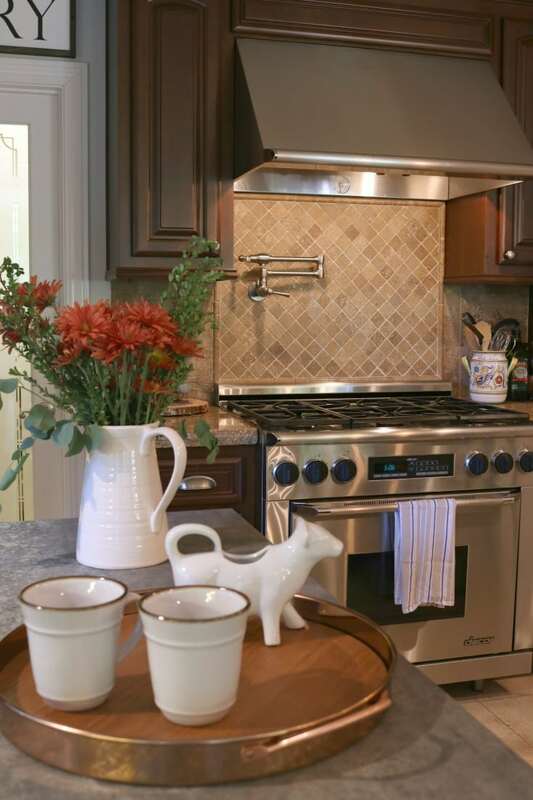 The neutral finish helps it blend with just about any color palette. I always say value lies in the versatility as well as the craftsmanship. This piece has so many uses that I know I’m going to enjoy. 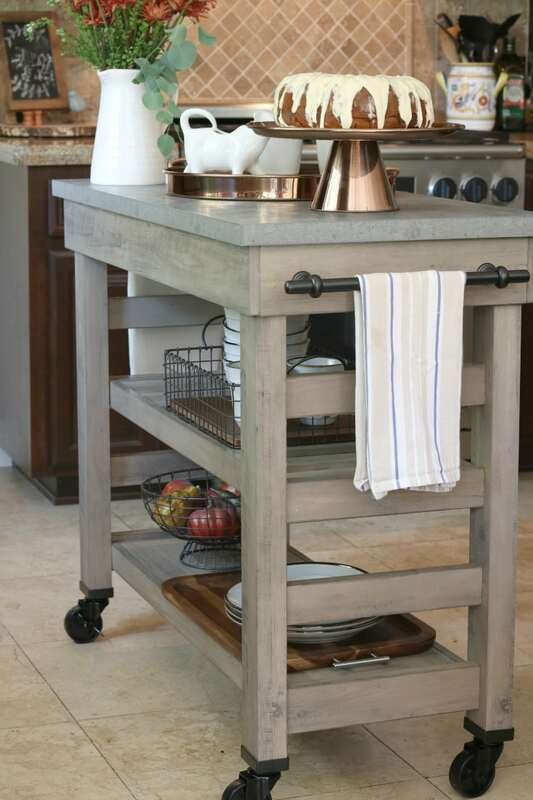 The casters allow it to roll easily to serve a variety of functions. They lock so you can use it as a solid addition wherever you want. But I can definitely see using this as a coffee station or a serving station for a dinner party or event. 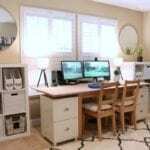 I love not only the additional counter space/work space it provides but also the additional storage. I can see this cart working well in a craft room or a laundry room just as well. 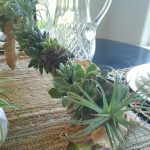 Better Homes & Gardens at Walmart does it again, Friends! Did someone say ‘More Storage’? I love the versatility of the second shelf. 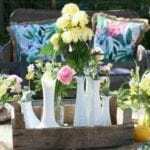 You can raise and lower the height of the shelf quickly and easily to suit your needs, and you can choose from a flat surface or a slatted surface (like I have) which makes holding bottles of wine or sparkling water ideal. And do you love the wire baskets and trays I found? They mix so well with the farmhouse style I love so much. Don’t worry! I linked those too! I love decorating for fall. 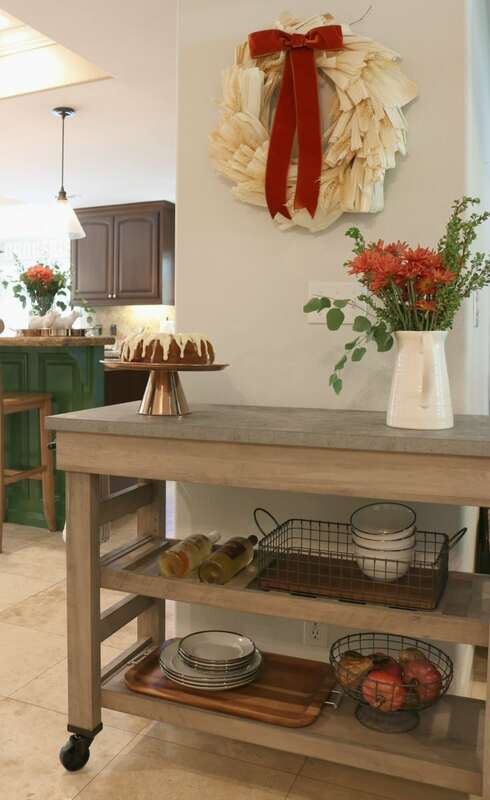 And while the kitchen isn’t the first place you think of for fall decorating it’s still fun to bring in some new touches that reflect the season. Can you think of anything better than rich copper accents for fall?? 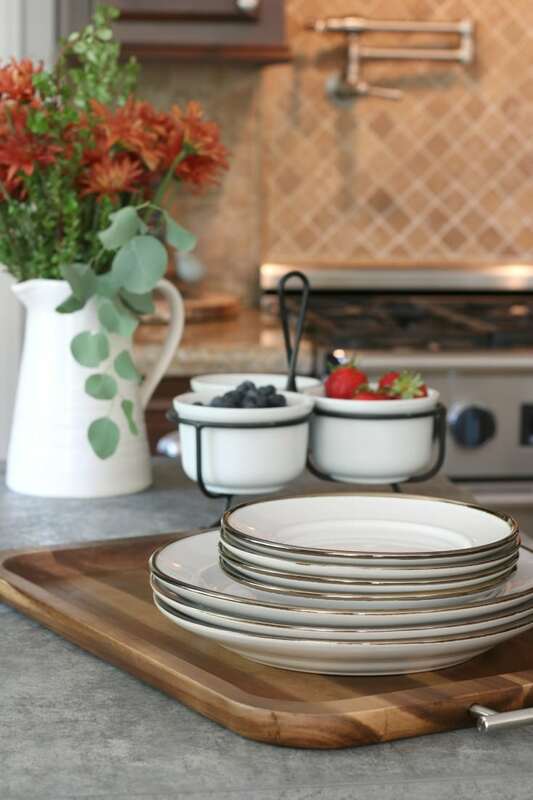 When I was shopping at Walmart.com and saw Better Homes & Garden’s copper kitchen pieces I fell in love. 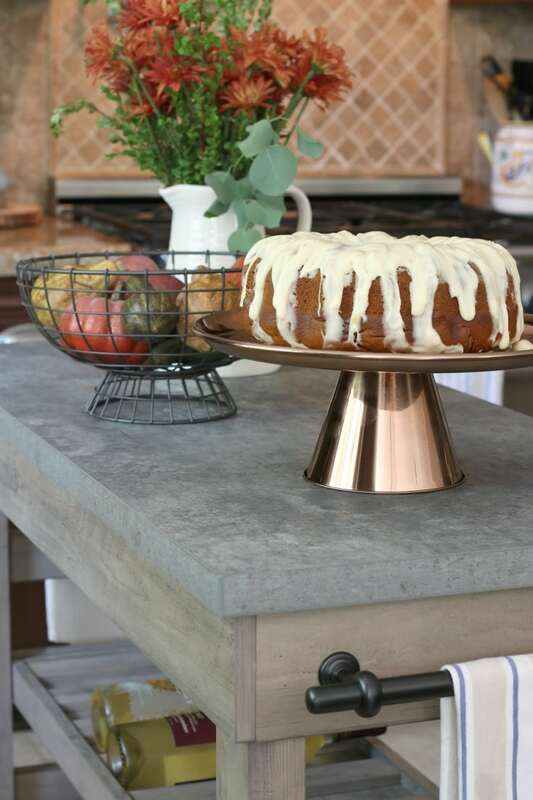 This copper cake stand and faux wood round tray with copper handles are perfect. Bring on the Farm House Details! 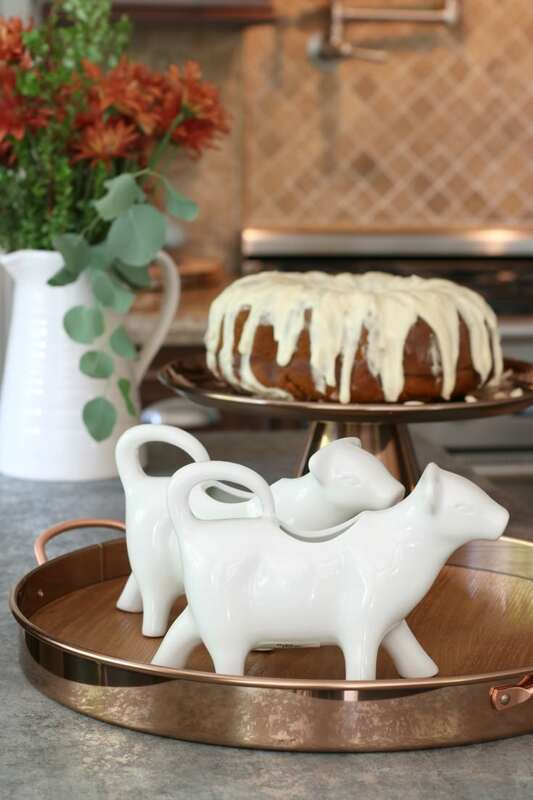 How cute is this set of ceramic cow creamers! I love the farmhouse detail they add. 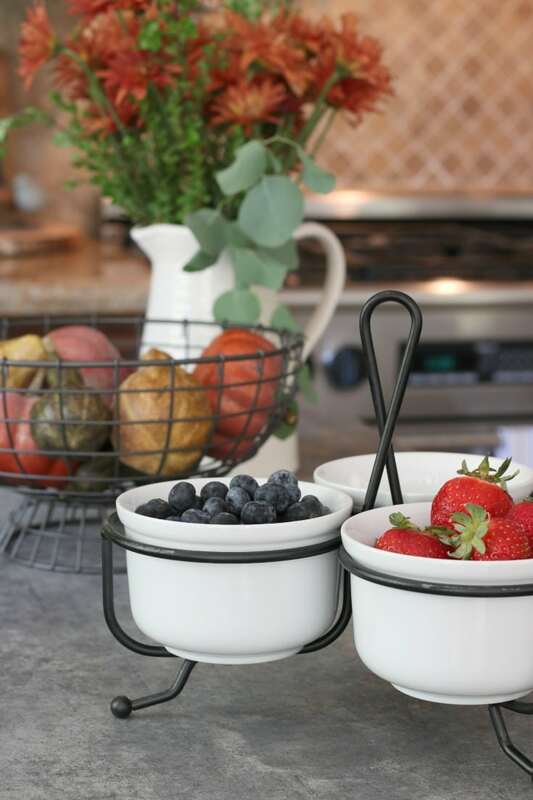 This Better Homes & Gardens 3 Bowl Condiment Tray with Metal Rack is a great way to serve berries and cream; the perfect complement to pumpkin cake, don’t you think? 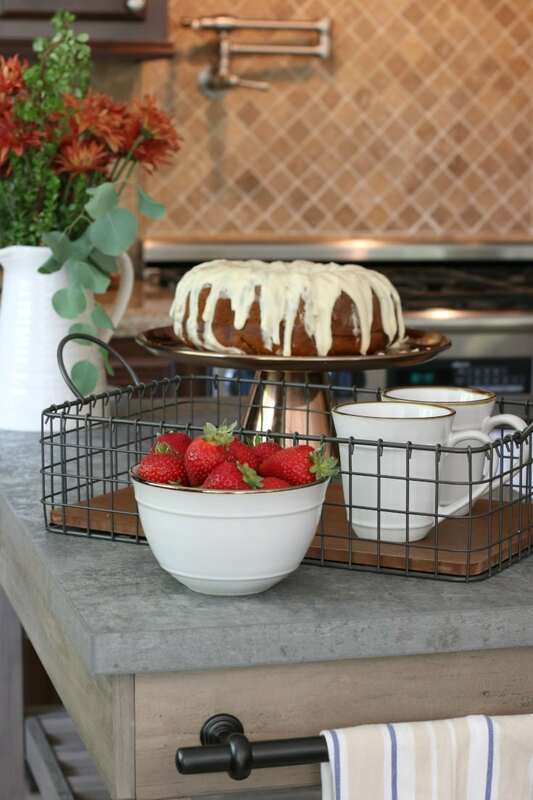 And a wire fruit basket in this antique gray finish adds another farmhouse detail. These days it seems we have to work harder than ever to create quality family time. With all the lures and all the distractions in this fast-paced digital world of ours sometimes it takes getting back to basics. That’s why I enjoy embracing Roan’s love of cooking. And when I can make the kitchen an inviting, work-friendly place that he’s excited to be in, nothing seems more important. It doesn’t matter what we’re cooking, it’s the time together that matters. What do your kids love to do with you? We’d love to hear your stories. 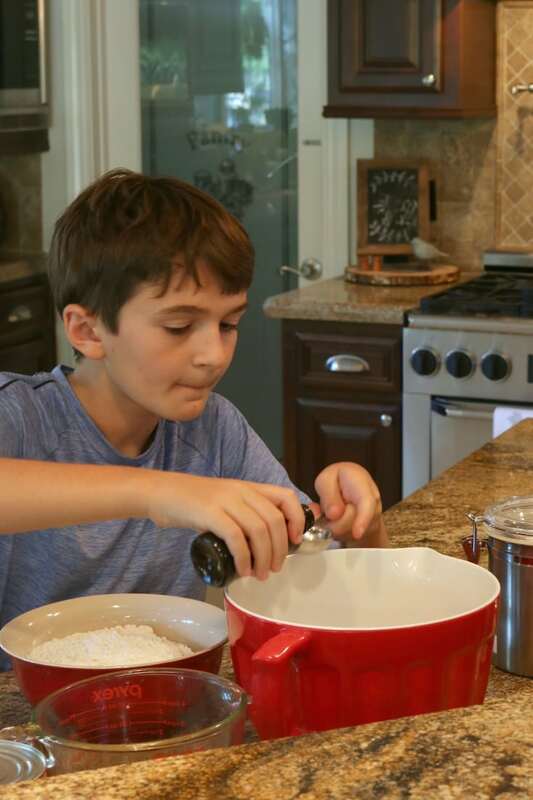 Learn how to create fun family time together in the kitchen with some easy awesome recipes. 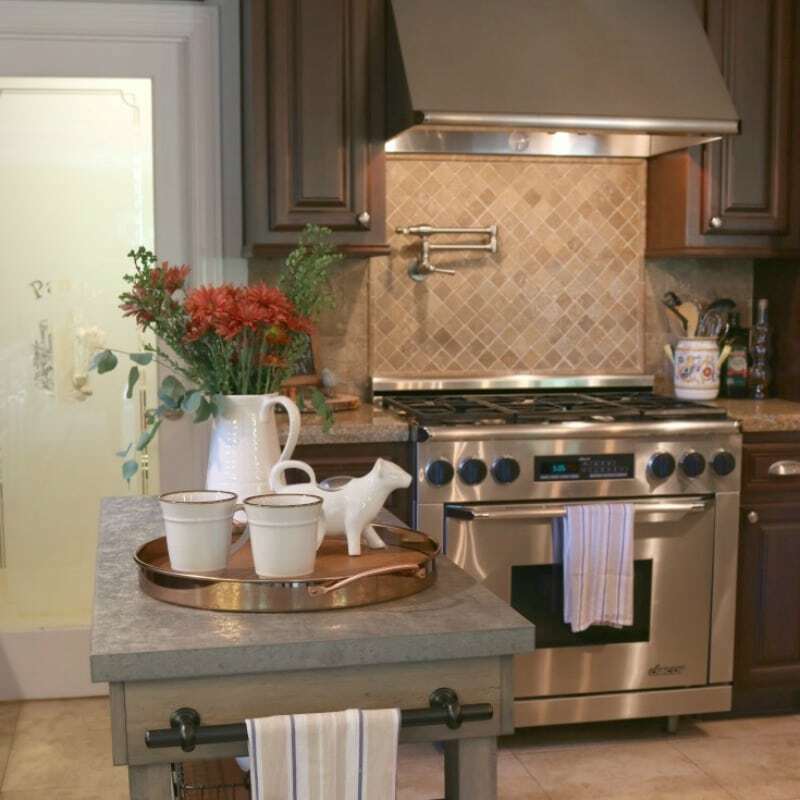 Also, I share how to build a work-friendly kitchen with quality, affordable products designed to make your life easier. Jodie, I absolutely loved this post. I love how you involved your family. 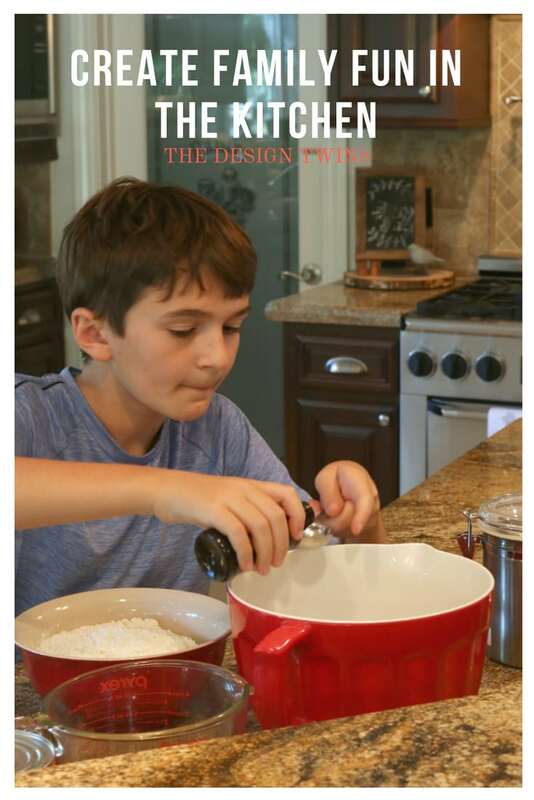 It takes SO much patience to include your children into the cooking/baking process, but what practical experience for them. Great job. As the mother of two grown sons and four grandsons and one granddaughter, you are correct they are not too interested in the things girls would do. One son loves to cook, the other is an outdoors guy. It is good to find something special that they like and spend time with them.